Soapers. We made wholly insufficient progress on this important element of the Primal Woods business model in 2017. That’s a huge problem, and one that needs to be addressed in 2018. Inside the Sugarers business, no sales of honey, and continued struggles in the apiary. 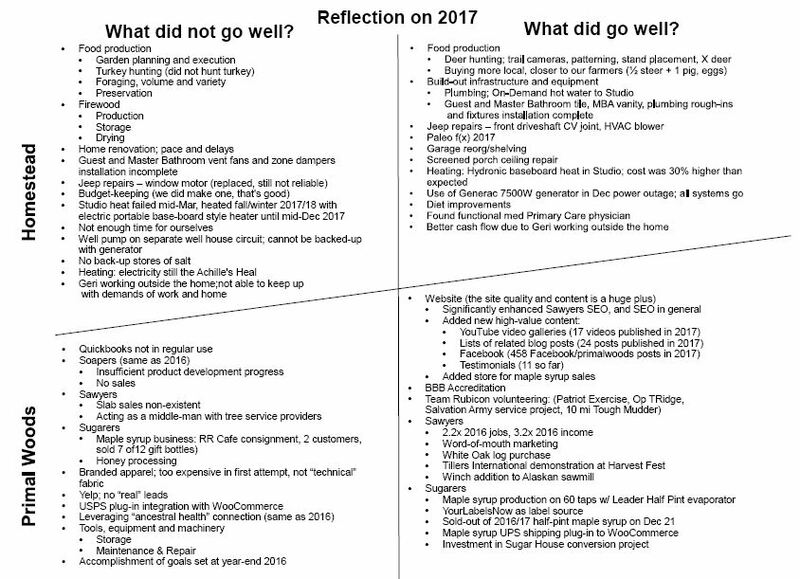 And, we accomplished precisely zero, as in none, of the goals I set for 2017 in the 2016 Year in Review blog post. Ugh! Now, some of that has to do with biting off more than we could chew, and part of it has to do with those goals having not been in alignment with what it takes to grow, and make successful, the Primal Woods business. I say that because I am reasonably satisfied with how the business developed in 2017. In our goal setting for 2018, I think we have done a better job, including the establishment of “Primary Objectives” for 2018. More on that later. Food production, firewood production, budget-keeping, and progress on the home renovation, less the infrastructure improvements. With Geri back at work, the garden was neglected, and production from the garden was, for the most part, non-existent. That’s not okay. The lack of regular and sufficient firewood production means that I am now faced with being “hand to mouth” in the feeding of the outdoor wood furnance. Our failure to hold to the budget, means we are consuming capital to satisfy expenses, which is not sustainable. In summary, I guess you could say the Homestead took a back seat to Primal Woods, and to the stemming of negative cash flow, which involved putting Geri back in the workforce, off-farm as they say. This is really comes down to how I am feeling about what was accomplished, and not, in 2017. With respect to Primal Woods, I would say I’m pleased but not satisfied. Revenue was up 3x on 2016, and is still nowhere close to being sufficient. From a cash flow perspective, given the relatively large investments we have made in the Sawyers business, and are still making in the Sugarers business, the view is negative but improving. Negative cash flow is a company killer, and cannot be sustained, so revenues must absolutely continue to grow if we are to achieve “The Purpose.” In the face of that, the big increase in the sawmill business was satisfying, as was selling out of maple syrup in December. And the people we have had the pleasure of meeting along the way, well, that’s priceless. Many of these challenges, aka problems, I wrote about in my post, okay, it was a rant, Making a Living, and a Life. Life is a journey, and getting over, under, or around or through, getting past the problems, is a necessary part of growing as human beings. So, we have problems, and I am thankful for those problems. Life would be awfully dull in the perfect world. Install non-climate controlled storage to free up north garage bay for other uses; e.g. office space, vehicle and equipment maintenance, butchery, small projects, etc. Even the Primal Woods Primary Objectives are daunting. It’s going to be an extremely challenging year. Ditto for the Homestead Primary Objectives, daunting. Wow, if all of the Primary Objectives are attained, I will be more than satisfied, pleased even. We will have to be a lot smarter to do it, and probably work a lot harder, too. And importantly, involve more of our community in the process. Building community is part of “The Purpose,” and is both necessary and desirable. For example, this will be the first year where we have enlisted the aid of others in the production of maple syrup. A five hundred tap operation is simply more than I can do, alone. And part and parcel of making maple syrup, is the involvement of the community. This is what it’s all about. Speaking of which, if you are interested and can make yourself available to help, let me know; I’m developing a “HELP” email distribution list. At this point I’ll take all the help I can get. On the Homestead, it’s all about making the House a home in 2018. The home is Geri’s turf, and I will be mustering up all of the energy I can in support of her efforts. The chicken coop you ask, well, we enjoyed having chickens free ranging on the property when we raised some meat birds a couple of years ago. The crowing of the rooster(s) in the morning, yup, we love that, too. An additional benefit, one of many, is home-grown meat and eggs. I hope you will join us on this journey of building the Primal Woods business, and of developing our Homestead. These lists are a great idea and a valuable aid in keeping track of things. I do this in my head for our homestead, but I should really start committing things to paper. Thanks for the idea! You are very welcome Eric, and thank you for reading and commenting on the blog; it is greatly appreciated. Regular reflection, and then taking appropriate action, is a great way to keep the improvement train rolling. If you have not, you can subscribe by email to the blog, upper right corner if you are on a pc. Thanks again.